Here’s the first of the guest artists filling in for me while I’m away on Spring Break. Don Ahé, creator of Road Apples Almanac, surprised me with this fantastic interpretation of Ellie and Jeff! He said he had so much fun creating the pin up he did a few weeks back that he felt compelled to do a whole strip. I’m glad he did and I’m thrilled to be able to share it with all of you. And make sure you check out Road Apples Almanac. It’s quickly gone right to the top of my list of favorites. See you all on Thursday for another guest comic! Love this guest strip! Well written and nice nod to one of the greatest comic strips of all time too. Isn’t it great? “Love Is…” has always been one of my favorites! Thanks John, yes the last panel with muffin is a nod to the “throwaway” panels in Krazy Kat that may be replaced with candy bar ads. B3? Is that the King’s side, or the Queen’s? Thanks Denver, i am new to mission control , and i’m honoured to work here. 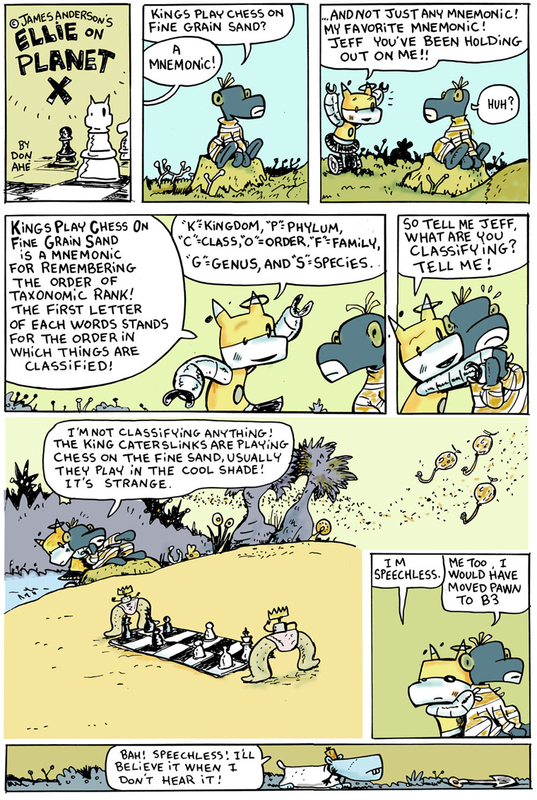 I just learned that in the Caterslink chess game the ” king” is called the “Dinner” piece or “son-in-law” piece appArently those two words are interchangable in the Caterslink language. Dont quote me on that, like i said am new here. Now I want to play this game. I’m gone for a day and look at the cool stuff that happens. I’m speechless as well… Great stuff! aaaaah!my sister taught me the taxonomic rank when i was 6 or so,(i still have no idea why)and to this day i remember it. this is such a cool guest comic!